A Jetstar Pacific passenger jet parked January 2009 at Changi International airport in Singapore. (CNN) -- Authorities in Vietnam have arrested the former chief executive officer of Jetstar Pacific Airlines and are preventing two airline executives from leaving the country, Vietnamese and Australian officials said. The former chief executive, Luong Hoai Nam, faces prosecution for "lack of responsibility causing serious consequences," said a spokeswoman for the Vietnamese Foreign Ministry, Nguyen Phuong Nga. 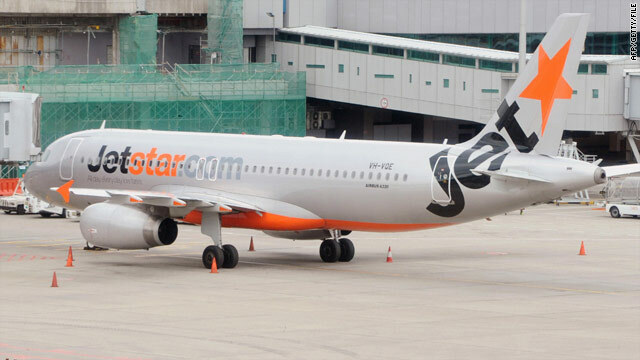 Vietnamese authorities are investigating the airline's chief operating officer, Daniela Marsilli, and its financial officer, Tristan Freeman, Jetstar Pacific said. They are not allowing Marsilli and Freeman to leave Vietnam, the airline said. Jetstar Pacific is partly owned by Qantas Airlines of Australia. The Australian Embassy in Hanoi is seeking details about why the employees are being prevented from leaving Vietnam, according to Australia's Department of Foreign Affairs and Trade. The airline suffered heavy financial losses, the Vietnamese Foreign Ministry spokeswoman said, and investigators are trying to determine the responsibility of members of the airline's executive board and managing board.